Another feature of the workload report is that it breaks down the status of Marcellus Shale permit applications from 2005 through the present. How selective is the process? Of the permit applications received so far, 94 percent have been approved, and four percent are still in the process of being evaluated. Only 31 applications (0.4 percent) were actually denied. 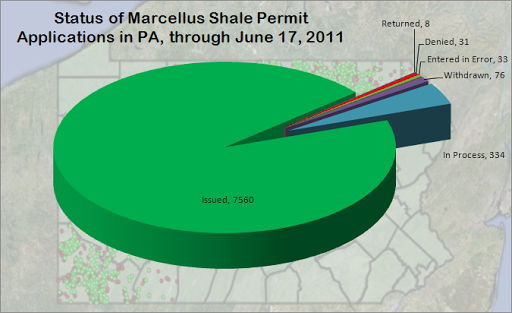 Between the Marcellus Shale and other formations, the DEP has issued over 16 permits for new wells every calendar day so far in 2011. Last year, there were more than twice as many violations per inspection from the Marcellus Shale than from other formations, while this year the non Marcellus wells are being flagged more often. This is both because the rate of violations per inspection for non Marcellus Shale wells has risen by 35 percent over last year’s figure, and because Marcellus Shale wells are being flagged 41 percent less often this year than last year.